Our series of captivating ballets begins with three enchanting performances of La Fille Mal Gardée (Tuesday 20 – Wednesday 21 December), which is a gentle and comic tale of love thwarted, unrequited and found. 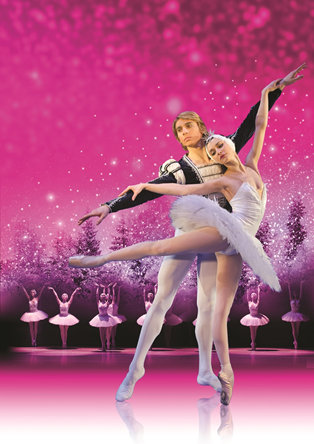 Filled with ribbons, rivalry and romance, this ballet is sure to delight young and old. Then get ready to be swept off to a mysterious place where nothing is really as it seems in The Nutcracker (Thursday 22 – Wednesday 28 December). Watch with astonishment as toys spring to life, and the treacherous Mouse King battles the handsome Nutcracker Prince. The series climaxes with the greatest romantic ballet of all time, Swan Lake (Thursday 29 December – Monday 2 January), which features Tchaikovsky’s haunting score. From the majesty of the palace ballroom to the moonlit lake where swans glide in perfect formation, this compelling tale of tragic romance has it all. All prices are subject to an additional £3.95 Ticket Service Charge per transaction and an optional 95p postage fee.